For years, everyone involved in the TV or phone business has boosted their profits using increasingly dishonest tactics, all made legitimate by a few paragraphs of fine print on ever advertisement. For example, the advertised rate doesn’t actually include all of the costs necessary to use the package you are buying. There are plenty of add-on fees, plus modem rental, DVR rental, and so on, which I noticed not long ago when comparing Comcast to CenturyLink here in Denver, one of many articles about cable bill scams I’ve written over the years. Since all the TV and phone companies use this low-priced trial offer, it was somewhat surprising today to see that the FTC is charging DirectTV with false advertising regarding it’s introductory trial offer of service. Or, as the FTC blog says, “there’s DIRECTV — and then there’s Deceptively Advertised DIRECTV.” – Ouch. The key to this particular allegation seems to be that the FTC doesn’t believe that DirecTV made it clear enough that even though the trial offer was for one year, that the contract was for TWO YEARS. In other words, you were signing a contract to pay the low price for one year, and the high price for the second year. Cancellation fees were over $400 according to the FTC complaint. Contrast this to Comcast which offers a low one-year rate and a matching one-year contract. The interesting part here, is that in my experience this IS disclosed somewhere. In fact, when we finally cut the cord from cable earlier this year, one of the issues was the option to bundle DirecTV (or get Dish Network separately) with our CenturyLink internet. I refused to get DirecTV because I saw that I would have to sign a two-year contract and that my rates would be ridiculous during that second year. In fact, the even more deceptive practice is that CenturyLink’s website explicitly states that you are signing up for a one-year contract. What is not made clear is that this contract duration is only for the CenturyLink part. If you bundle DirecTV, then that part has a two-year contract, even though you are only signing up for one-year with CenturyLink. The only reason I caught that was that I had already investigated DirecTV and wanted to make 100% sure I wasn’t accidentally signing up for a two-year deal with them. Click enough of those little informational buttons, and you eventually get the actual terms of service, and sure enough, there in the contract language it says that you are indeed signing up for two years. Curiously, I think this is the same practice at Dish Network, the question is, will the FTC be suing Dish Network (a.k.a. Echostar) next, or is there something about the way that Dish displays its fine print that makes it acceptable in the eyes of the FTC? 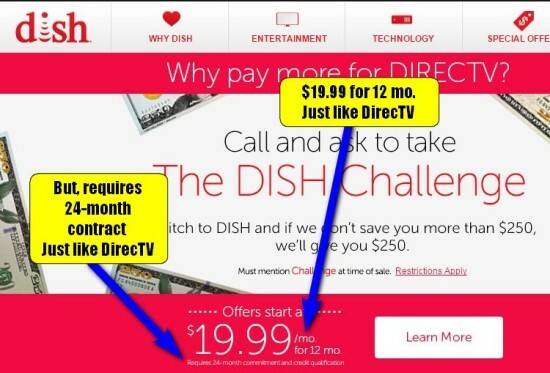 This screenshot is from the Dish website today (3/12/15) and has the same bold print for 12 mo. with the same tiny but you are signing up for 24-months below. DirecTV’s argument will be, as always in these kinds of cases, that it did disclose (and had the customers sign that they got said disclosure) the necessary information and that customers were required to find it, understand it, and live by it, no matter how many didn’t realize they what they were getting into. To win its case, the FTC will have to prove that whatever disclosures the company made were not sufficient. Of course, none of that will happen. Instead, the company and the FTC will pick an amount of money that is insignificant to the company (other than as a write off on its financial statements) but that sounds impressive to the public to be the fine without the company admitting any wrongdoing. Then, here comes the irony, the company will agree to disclose information better. Exactly, what kind of fine print and buried contract language will be used for that will be up to the company. Is T-Mobile Free Switch Offer Worth It? As someone dissatisfied with my current cell phone carrier, I was curious about T-Mobile’s switch for free offer. I’ve heard the radio commercials and seen the signs, but I know there is always more to any deal than the bold text. I wondered, is the T-Mobile switch for free deal really a good deal, or was it some sneaky scam. 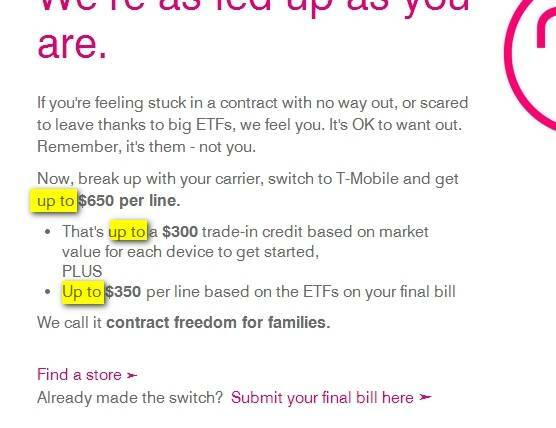 I figured I could look into it, and then blog about the real deal on T-Mobile’s pay you to switch deal. Reading the fine print, and understanding what you are getting into beyond the blaring headlines of an advertisement is probably the most important day-to-day money management skill a person can have. Too often, someone’s personal financial planning intentions get dropped out the window thanks to unanticipated expenses or monthly costs. Worse, sometimes these decisions are costly, or even impossible to reverse. The headlines for this deal scream that T-Mobile will pay your early termination fees and that they’ll even give you a big credit toward a new phone. Is this a great deal, or is this going to turn out to be some switch carriers scam from T-Mobile. The web page for the switch to T-Mobile for free offer is littered with up tos. What is the deal with these up tos? Will need to get beyond the bullet points to find out. Is The T-Mobile ETF Refund Legit or a Scam? Let’s start with the Early Termination Fee refund, or ETF pay back. It turns out that the, up to, here is completely fair and harmless. T-Mobile will pay up to $350 per line for your ETF fee, but only if your ETF charge is actually $350. If your final ETF cost from your original carrier is only $200, then they’re only going to pay $200. In other words, you aren’t going to profit from the deal. This is totally legit and fair. There is one catch that you want to be aware of though. Retailers of all kinds have gotten in the habit of giving you a refund, or in this case “paying you to switch,” via something other than cash in the form of a check. In this case, T-Mobile requires you to submit your final bill showing your ETF charges, so they know how much to pay you for them. Then, you get a prepaid MasterCard for the amount within eight weeks. Why does this matter? Well, if your finances are in good enough shape, it all sort of works out in the end. You pay off your final bill. Then, when you get the prepaid MasterCard, you buy groceries with it instead of using your checking account, and boom, you’re even. If you don’t have as much wiggle room in your budget, however, you’ll need to plan ahead. The mechanics of how the T-Mobile ETF refund part works is that you will have to pay your old carrier for the ETF fees when the final bill is due. In most cases that will be within 30 days of receiving the bill. However, you won’t get your prepaid MasterCard for up to 8 weeks. If you are switching 4 lines with $200 each in termination fees, you need to able to cover that $800 for up to 8 weeks before you get your $800 card. Then, you need to be aware that you are going to get an $800 MasterCard, not an $800 check. Again, if you have enough cash, it really doesn’t matter, but your landlord might not take a credit card for your rent. To minimize the lag between when you have to pay out your ETF fees and when T-Mobile gets you your MasterCard, be sure to submit your bill right away, then pay your bill on the last possible day. If you’re lucky, that will cover three to four weeks for you and you’ll only have to wait four or five weeks more to get your card. Assuming you plan correctly, there is no way to lose on the ETF refund part of T-Mobile’s offer unless you have an ETF charge higher than $350 somehow. So far, this T-Mobile switch for free offer is legit. The next part of the switch for free offer from T-Mobile is a credit toward the purchase of a new phone. Depending upon what kind of phone you have, what kind of phone you want, and when you last purchased the phone, this is the part of the offer where you say, “Oh. I didn’t realize that.” This is the T-Mobile switch offer catch, if you will. In order for this switch to be truly free, you would have to get your new phone at T-Mobile for free, because the deal requires that you get a new T-Mobile phone, and that you trade in your old phone for credit toward that phone. You cannot participate in this deal without buying a new T-Mobile phone and signing up for a qualifying plan. You are supposed to go into a T-Mobile store to do the trade-in part of the deal, so it isn’t really clear resource online about how much your particular device will be worth. There is an online device trade-in area on the website, but you have to login to your T-Mobile account to view it. Suffice to say, you definitely want to find out how much your phone is worth up front. Let’s say that you recently bought a Sprint Galaxy S4 phone and you want to switch away from Sprint because they still don’t have any 4G coverage in Denver and their 3G coverage is terrible. It’s reasonable to assume that a current model, working, Samsung Galaxy S4 phone is going to be worth the full $300 credit, or at least close to it. So, how does switching to T-Mobile using this special offer impact this customer? While I can’t find a trade-in value online, I can browse the latest phones, where I find that replacing this phone with a T-Mobile Galaxy S4 will cost $624 plus $10 for a “SIM starter kit.” (I guess the necessary SIM card for your phone to function on the T-Mobile network is not included. I call that a T-Mobile scam, but that’s a different article.) Since I’m only getting a $300 credit, I’ll have to pay $334 to switch, “for free,” (per phone). If your phone is older, then this is less of a big deal since you might be buying a new one anyway. Of course, if your phone is older, then it probably isn’t worth a full $300 trade-in credit either. Is T-Mobile Switch Offer a Good Deal? So, if you were already planning on buying another phone in the near future, this still might be the deal for you. Otherwise, you’ll want to be doing it for other reasons such as better service, improved coverage, or another reason that you might have had even without the offer. Here’s the really weird thing. Nowhere on T-Mobile’s website does it call this a switch for free deal. It says that they’ll pay your termination fees for you. Now, I’m confused. Is it billed as switch for free on the radio, or what that just what some over-hyperbolic reporter said in the news articles I read when I first heard about the deal. 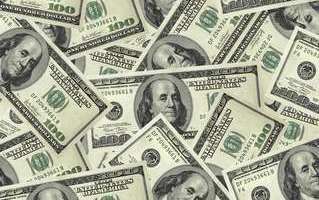 Generally, this website focuses on the slightly more complex personal finance advice and other money issues. However, every once and awhile, I get enough motivation to fire off a tidbit of money saving advice on something smaller and easier. This evening, I finally got pushed over the line by one of those little things that companies do to wring a little extra money out of their customers. Years ago, laundry soap came in big boxes and big bottles. The bigger the bottle of laundry soap, the more loads of wash it did. Then, laundry soap manufacturers figured out they could concentrate their liquid laundry soap. In doing so, they could ship more product to the stores for the same cost, and stores could keep more product in stock thanks to smaller bottles. Of course, at first, this took a fair amount of consumer education because people were very used to the concept that bigger meant more. Finally, laundry companies settled on printing on the bottle just how many loads of laundry each bottle could do, and that was that. Along the way, however, those same companies couldn’t pass up a chance to cheat their customers out of a little more money. If you control the cap, you control the measuring. You’ll notice on the front of the bottle, it says, “44 loads” or “33 loads” or whatever. If you look closely, you’ll see an asterix. If you look for that asterix, you’ll need to turn the bottle over. It’s on the back. There, you’ll find that it does 44 loads when measured to Line 2, or that it does 33 medium loads when used as directed. 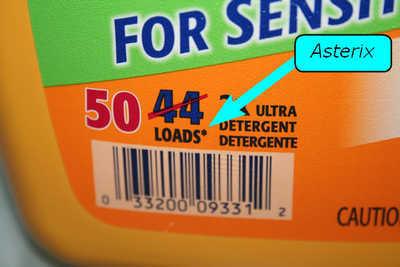 You may have never read the directions to your laundry soap. Who could blame you? They’re all the same, right? Not exactly. Go ahead and check the bottle. On one of the bottles I have it says “Fill Cap to bar 1 for medium loads.” On another, it says to fill to Line 2 for medium loads. Both say to use a full cap for large or heavily stained loads. Think you’ve been filling it to bar 1? Time to take a look. You are going to need a very bright light, and if you use glasses for reading, you’ll need those too. Now, if you’ve never looked, you may be surprised that the big, easy to see, ridge in your laundry cap is likely nowhere near where bar 1 is. If you’ve been filling all the way to the top of the cap, chances are you’ve been using WAY too much unless you are always doing large, heavily stained loads of laundry. Take the cap off and look inside. Don’t forget the bright light, it is DELIBERATELY hard to see inside there. I couldn’t do anything to get that nearly invisible line to photograph. You’ll have to take my Sharpie mark for this picture, but check your cap. It won’t be any different. 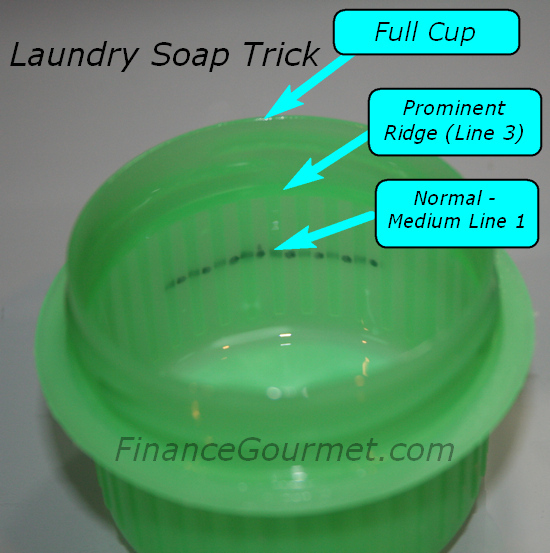 Chances are it is about half-way down from where you might instinctively fill your laundry soap cap for a “regular” load. That means if you are filling it to the obvious line, you are using approximately double the laundry soap, and therefore getting about half of the number of loads listed. To make sure you are using the right amount of soap, always open the cap in bright light. 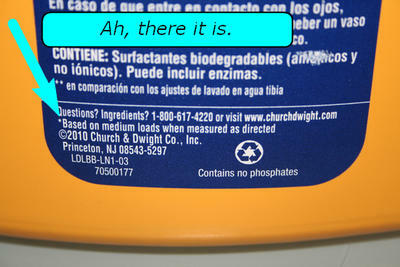 Read the back of the bottle and find the medium load line, wherever it is, however hard it is to see. Now, take a Sharpie or other pen and make a line on the outside of the cap where the fill-line should be when you do laundry. Now, you won’t be overusing soap when you are trying to quickly do a load of laundry. Recently, I had a very nice family vacation. Now, I travel on occasion for business, and often when we travel we setup via the same system. The rental companies don’t really bother with the tricks, because they have a blanket contract with the company. This time, however, the family and I went on our own. In doing so, I noticed more than a few of the most common travel company tricks have been updated, and some new ones are out there as well. So, without further ado, let’s look at the latest car rental company tricks to increase your bill. The travel industry was once the domain of luxury travelers and big spenders. Travel companies just charged high, profitable rates for everything from hotel rooms to car rentals. But, along the way, travelers got savvy. Internet travel websites opened people’s eyes to the vast difference in pricing, and the race to the bottom was on. One way travel businesses, like rental car companies, compete is by offering a rock bottom, low price, for a car rental, with every intention of boosting those rates back up with fees when you actually rent the car. Avoiding a high rental car rate doesn’t end when you book you rent you car and have a reservation. You’ll have to keep playing defense to get a good rate on your rental car. Check out my article about Southwest Airlines child fares here. Once upon a time, car rental companies made plenty of money by selling insurance along with their rental cars. Rental car insurance could add $25 per day, or more, to your bill by the time it was all said and done. Suddenly, that bargain car rental you got online just got a lot more expensive. Fortunately, the financial advice media were all over this little travel trick, and people wised up and said no to car rental insurance. But, that insurance is very profitable for rental companies and they won’t give up that easily. Quick tip: Call your car insurance company to see if they cover rental cars. The answer, if you have any of the well-known insurance companies, is that you are fully covered for all liability in an accident, just like you are if you borrow a friend’s car. Whether or not you are covered for damage to the car usually depends on whether or not your have comprehensive coverage on your own car, in which case you are usually also covered for the rental. Next, check your cards. A lot of credit cards offer free rental car insurance if you use their card, often including damage to the car. However, almost no one covers your rental car in Mexico, so double check that. Don’t get me wrong if you aren’t savvy, they rental company will be happy to sell you all the insurance coverage you will take, but they have some “new” moves as well. I rented from a combined Dollar Rent a Car and Thrifty Car Rental location. Everything from which people handled your transaction to which cars you could take were the same, so there was no difference between two companies. First, they found my reservation. No problem there. Then, the upselling car rental tricks began. Of course, I said no I don’t need any of the insurance. If that’s true, then most people take it because they are confused and don’t know better. The waiver is also insurance no matter what they call it. It is the insurance that covers your usual deductible. So, it isn’t always duplicate coverage, but it’s still coverage. At nearly $10 per day, that adds $70 to a weekly rental. Considering my whole rental for the week was $230, that’s a hefty 30 percent add-on if you aren’t paying attention. The car rental fuel option is a devious trick that sounds like a good deal if you listen to the person behind the counter. The way this scam works is that you prepay for a FULL TANK of gas at a “discounted” rate. See that highlighted, bold phrase? That’s how the scam works. You pay for that full tank no matter how much is left in the car when you return it. Unless you bring your car back into the rental lot where it runs out of gas, you aren’t getting any sort of discount. In fact, you’re paying extra. It only gets worse if you leave more gas in the tank. The way they sell this is by asking, “Will you be using a full tank of gas?” and then pointing out how it is cheaper for them to refill it than you. This would be true, if they actually came and filled up your car when it was empty, but they don’t. You fill it up when it is empty and likely bring it back to the lot with plenty of gas in the tank. After all, who wants to run out of gas on vacation? Decline the fuel option and save yourself some money. If you need a bigger car, get it when you book. You’ll notice that the difference between a compact and a mid-size doesn’t have to be a lot, and another company might have the bigger cars for less. Get what you want when you make your reservation and don’t let them change your mind when you get there. Rental companies will rent you a car seat for your children. In most states they are required by law to make them available. They are not required to be nice, comfortable, or treated well. At this location, I saw them piled up in a closet. They also cost $10, or so, PER DAY to rent. If your kids aren’t toddlers, check the state laws to see if a booster seat is sufficient for your kid. You can buy a basic (no back) booster at Target for less than $30. Put two of them together in a bag to check both for $20 and you saved yourself a lot of dough versus $20 per day ($140 per week!) to rent two seats. There are plenty more travel scams and I’ll be back to cover them as well. Remember, do your research and understand what you want and what you need before you get to the counter and then hold to your own decisions. Don’t let leading questions increase your car rental bill.